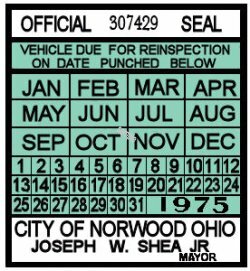 1975 Ohio Inspection Sticker Norwood - $20.00 : Bob Hoyts Classic Inspection Stickers, Add a Final Touch to your Restoration! This 1975 Ohio sticker was digitally restored and reproduced, both front and back keeping true in color and size to the original. Apparantly, Ohio had some sort of double standard here with inspections for the state and some cities.